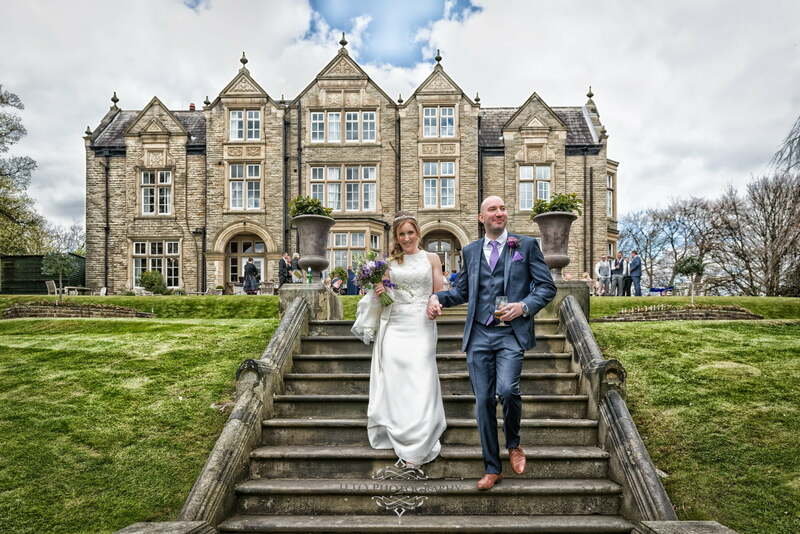 Being a Leeds wedding photographer in West Yorkshire, we’ve obviously seen plenty of venues, but it’s great when we get to cover weddings at places we’ve not been to before, and this time it was the Woodlands Hotel Leeds. Having heard good things about it, it certainly didn’t disappoint! It has pretty much everything you’d need. If the weather is great, there are plenty of sprawling landscaped garden to mess around in. If it rains, there are plenty of rooms to use and a conservatory too! You always hope for good weather the day of a wedding, but lots of venues can be a struggle if the weather goes south, but not this place! Again, West Yorkshire was on top form weather-wise – and although as a wedding photographer I moan about blue skies, I do kind of like them! Helen and Ryan drifted through the ceremony with ease. No nervous fumbles, mistake or tears, and we snapped away as they walked down the aisle to confetti flurries when it was all done. Back outside for some rays, with drinking and squinting in full flow! Before long, we all headed inside for the wedding breakfast and speeches. We obviously here all kinds of speeches, but Ryan’s Best Men delivered something on a different level! We honestly can’t remember the last time we laughed so much.